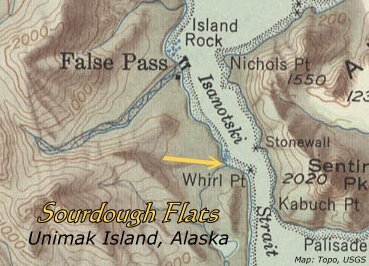 Sourdough Flats was a small inhabited place on Unimak Island, just south of False Pass, in a small cove just north of Whirl Point. 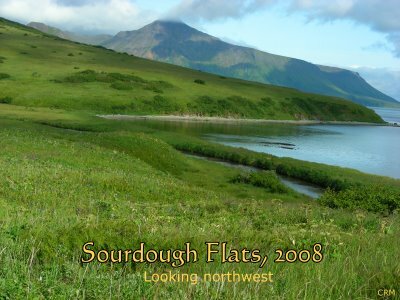 The Flats was once inhabited by a small group of hardy trappers and fishermen and early Unangan (Aleut) people. The location has a salmon stream where pink (humpback), silver (coho) and chum (dog) salmon spawn. 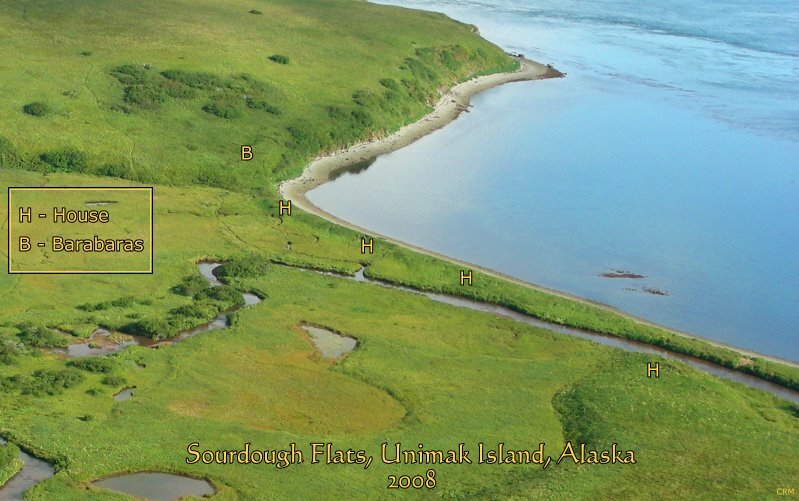 There are several barabara house pits here, indicating that during Aleut times, the location was used at least seasonally, probably for the harvest of salmon. The last residents of The Flats were Odd and Alice Steffensen and after Odd died, Alice moved to False Pass in 1965. 1 The house had been built by John Finnegan and later it was sold to "Wild Cat" Olsen who rebuilt it. Odd then bought the house from "Wild Cat".2 Other residents, such as John and Anna Hoblet and the Ferguson family, had moved to False Pass at an earlier date. 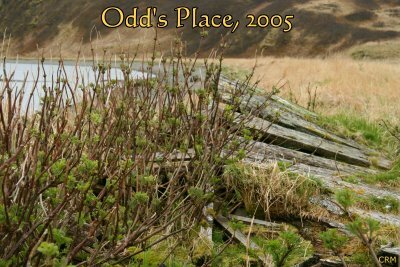 Odd's Place has now completely fallen down. River Otters use the old place for a den. 2) John Hoblet, personal communication, 1984.